I haven’t really got much to talk about tonight – I am mentally exhausted. Why do government businesses have to make things so difficult. What with taking care of Dads financial stuff and mine as well I am dealing with six different areas at the moment and they all want information, information information. I can’t send one area what they want until I get extra paperwork from someone else and so on. Anyway that is my little whinge – I might just veg out in front of the telly and watch Medium. 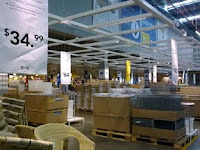 ** “Davine Time” update – I love IKEA – Today I had a little shop at Ikea, I just love the stuff they have there. Hello my dear. Sorry about the paperwork insanity....we have the same difficulties here. A pain. As large as ABQ is, we do not have an IKEA. The only time I've shopped at one was when I went to school in Dallas. Now I've got a question. Where are you when you are holding the wombat? I just saw a Discovery Channel episode on them, they are so incredibly ugly that they are cute. Sorta like my dog. Have a super day my friend with extra Davine time on top. I have all Dad's paperwork to do too - with a 20 February deadline! Must get started today! Very frustrating!!! I'm awaiting some correspondence from one of the agencies, so annoying with the waiting game. They act like paperwork is some sort of ancient and sacred invention we all must honor -- what rubbish -- they think it up, they could be more reasonable, but NO. It's very irritating to say the least and I also think it's a stalling tactic on the part of many agencies, and is also very cruel to those who can't manage such things themselves, such as the disabled or ill.
Government here in Canada is the same way. Would you believe that we got a letter for my Mom seven years after she passed away? This I still have to respond to, I am NOT the least bit impressed! Good luck with all your paperwork Davine. I see that you also have Ikea there, that store is pretty cool but I hate shopping in the "maze." I'll look online and if I want to purchase anything there ever again I'll just go and pick it up and be done with it. I'm glad that you're sticking to your special time each and every day, good for you. We all need time to recharge I believe! Thanks for your encouragement girls. I am going to tackle them next week. Linda - The photo with the Wombat was taken at a a farm on Flinders Island, Tasmania. They are very cute especially when they are young. Julie - Good Luck Feb 20th will be here before you know it. Shirleanne - Isn't waiting frustrating. Penniwig - Oh I so agree with you. Darlene - Oh that letter would have been so upsetting. It's the maze at IKEA I love.